North Korea conducted a failed missile test Sunday in defiance of increased U.S. warnings that there would be serious consequences for such provocative actions, including a possible military response. A White House foreign policy adviser said the type of missile that North Korea tried to fire Sunday was medium-range and it exploded 4-5 seconds after it was launched near the country’s submarine base in Sinpo in South Hamgyong Province on the east coast of the country. According to the adviser, who is traveling with Vice President Mike Pence, the U.S. had good intelligence before and after the launch. No planned response is expected from the Trump administration because there was no need for the U.S. to reinforce the failure. Vice President Mike Pence speaks during a town hall with business leaders in the South Court Auditorium on the White House complex in Washington, April 4, 2017. 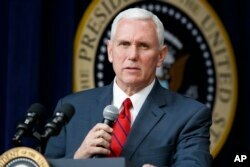 U.S. Vice President Mike Pence was briefed on the failed launch and had been in touch with President Donald Trump, White House aides said. Pence arrived in Seoul Sunday to begin a 10-day trip to Asia. The vice president was joined by his wife and two adult daughters. After laying a wreath at the Seoul National Cemetery, he was expected to join U.S. and South Korean troops for Easter church services and a dinner later in the day. Sunday’s attempted missile launch was reportedly not an intercontinental ballistic missile (ICBM) that Trump warned would not be allowed to happen, because it would move North Korea closer to acquiring a long-range nuclear ballistic missile capability that could directly threaten U.S. national security. The failed test occurred as a U.S. naval strike force moves into the region in a show of force, and amid increasingly tough warnings from the Trump administration that the U.S. is prepared to take increased measures against North Korea that include possible military action. North Korean leader Kim Jong Un waves during a military parade, April 15, 2017, in Pyongyang, North Korea to celebrate the 105th birth anniversary of Kim Il Sung, the country's late founder and grandfather of current ruler Kim Jong Un. 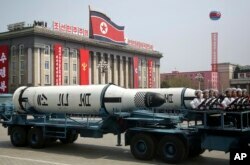 On Saturday North Korean leader Kim Jong Un presided over a massive military parade that prominently displayed what appeared to be new long-range and submarine-based missiles. The parade was part of a celebration of the April 15 birthday of its founding leader, the late Kim Il Sung, the country’s most important holiday known as the Day of the Sun. 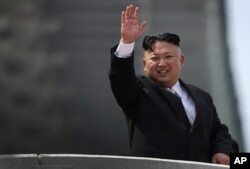 North Korea, however, did not go through with a nuclear test Saturday that many expected, based on reports of recent activity at the Punggye-ri nuclear test site indicating a test was imminent. Vice President Pence and his wife Karen arrived in Seoul Sunday to begin a 10-day trip to Asia. After placing a wreath at the Seoul National Cemetery, he joined U.S. and South Korean troops for Easter Sunday church services and a dinner. On Monday Pence will meet with acting South Korean President Hwang Kyo-ahn to reinforce the U.S. commitment to its ally in the face of rising tensions over the North’s weapons programs, according to his aides. The leaders Pence are to meet with in Seoul, however, will soon be out of office; South Korea is in the middle of a presidential campaign because of the recent impeachment of conservative President Park Geun-hye. Park was forced from office for her alleged involvement in a multimillion dollar corruption and bribery scandal. She currently sits in prison as prosecutors pursue a possible criminal indictment. The presidential election is scheduled for May 9. In a recent presidential debate, all the top party candidates, representing both liberal and conservative views, spoke out against the U.S. taking unilateral military action against North Korea. And the two leading candidates, Moon Jae-in with the Democratic Party and Ahn Cheol-soo with the People’s Party, both support direct dialogue with North Korea to reduce tensions, positions that may put them in opposition to U.S. policy. A submarine-launched ballistic missile is displayed in Kim Il Sung Square during a military parade, April 15, 2017, in Pyongyang, North Korea to celebrate the 105th birth anniversary of Kim Il Sung. Youmi Kim and The Associated Press contributed to this report.